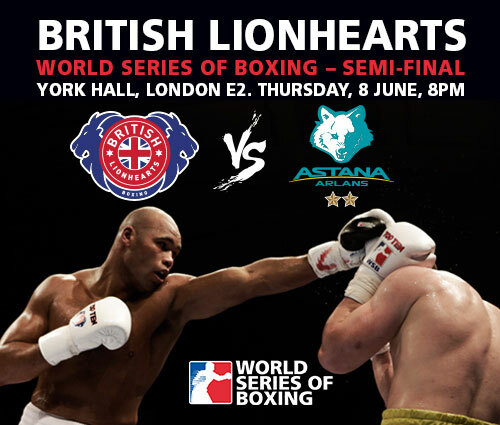 The British Lionhearts’ have named the 5 boxers that will take-on Astana Arlans Kazakhstan in the home leg of their forthcoming semi-final in the World Series of Boxing (WSB). The team for the home leg at London’s York Hall on Thursday 8 June 2017 will feature Birmingham flyweight, Niall Farrell and Liverpool light-heavyweight, Tom Whittaker-Hart. The pair are part of the GB Boxing squad and will be making their debuts in WSB. They will be joined by a trio of overseas selections. New Zealanders, Chad Milnes and Patrick Mailata, will box at lightweight and super-heavyweight respectively. India’s Manoj Kumar will complete the team at welterweight.